The original German Luftwaffe Fieseler F-156 Storch was an outstanding W.W.II airplane, designed to take off and land in extremely short distances. According to flight tests results quoted by S. Hoerner (Chief Aerodynamicist of the Fieseler Company) the Storch had a take off ground roll of 131 feet and a landing roll of 36 feet with 13 miles per hour head wind. The Pazmany PL-9 Stork is an 3/4 replica. It is not a look-alike. It authenticity is backed up by more than 9000 hours of aeronautical engineering design in order to obtain the same flying and handling characteristics of the original German Aircraft. 1. To provide amateur builders a professionally designed STOL aircraft which will please the sport pilot, the "nostalgia" pilot and the "bush" pilot. 2. To provide a well proven aircraft configuration designed for a number of functions such as : Border Patrol, Fish Spotting, Highway Patrol, Forrest Fire Detection, Property Surveillance, Farm Work, Pollution Detection, Missionary Work Etc. At the present, certification of the PL-9 is not considered. 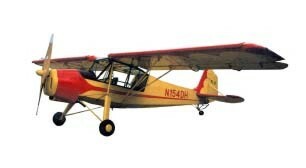 "Experimental Amateur Built" aircraft can not be used for hire in the U.S.A.
3. The welded chrome alloy steel tube fuselage. The aluminium sheet metal/fabric covered wing and empennage, seem to very popular with the amateur builders, although it is a 50 year old technology.